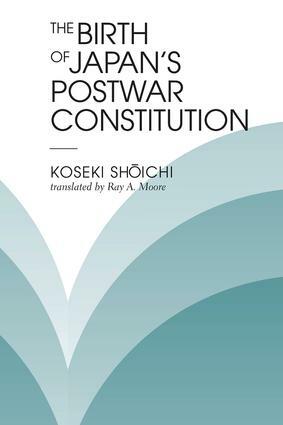 This 1989 Yoshino Sakuzo prize-winning book is essential reading for understanding Japan's postwar constitution, political and social history, and foreign policy. The most complete English account of the origins of Japan's constitution, it analyzes the dramatic events of 1945?1946 that lead to the birth of Japan's new constitution. Koseki Shoichi challenges the simplicity of the current interpretation that General Douglas MacArthur in February 1946, faced with inept Japanese efforts at constitutional reform and Soviet interference through the Far Eastern Commission, secretly ordered his staff to write a constitution in seven days and then imposed it on Japan. Differentiating between the adoption procedure and the framing process, the author argues that the latter was varied, complicated, and rich, going beyond the actions of two nations and their representatives. It involved the clash of legal ideas, the conflicting efforts of individuals of different cultures and different political persuasions, and significant contributions by people with no connection to government.Drawing on Japanese, American, and Australian archives as well as recent scholarly research, Koseki presents new and stimulating interpretations of MacArthur's actions, the Ashida amendment of Article 9, Yoshida's role, and much more. Criticizing Japanese conservative defenders of the old order, he explores Japanese liberal and socialist ideas on constitutional reform and reevaluates the Far Eastern Commission's influence on MacArthur's policies and on the shaping of the basic principles of Japan's antiwar constitution.